Candelero Beach Resort: 3 star resort that offers accommodations and options for all-inclusive packages. As of January 2019, the former Wynhdam property reopened as Candelero Beach Resort. 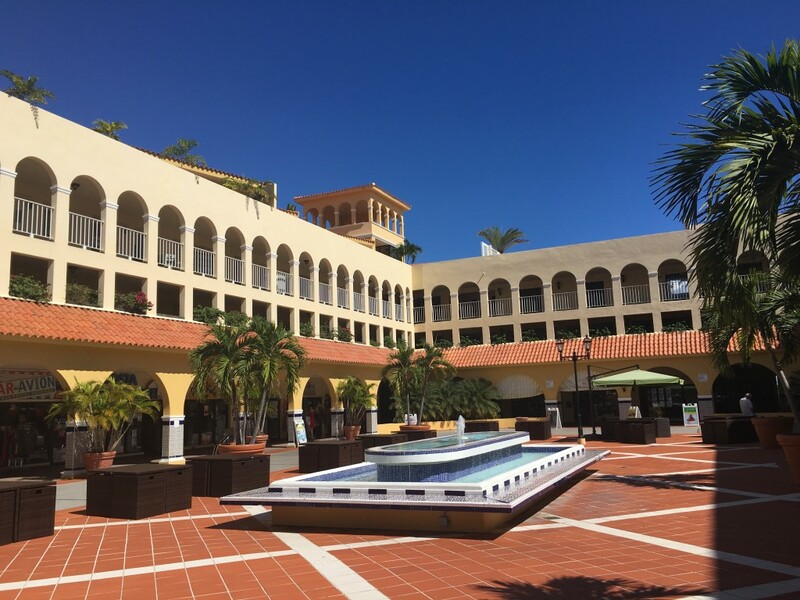 The Lobby and courtyard area were completely redesigned after Hurricane Maria. There is a nightclub, several restaurants and bars, plus a newly remodeled pool. Vacation Rental by Owner condos and houses are another great option: The beach houses and condos are a great way to save money if you are staying more than a few days. We stayed a week at a VRBO condo in Beach Village for a great price, and loved it! The Plaza Condo Suites offer a variety of hotel style and condo suites with kitchen, living room, and free wifi connection. Available for a single night, or longer stays with a discounted rate for monthly rental. The easiest way to get around Palmas is by Golf Cart. Target Rental Car has a desk right at the Wyndham resort, but brace yourself, prices start at $50 for 24 hour rental, and increase during high tourist season. 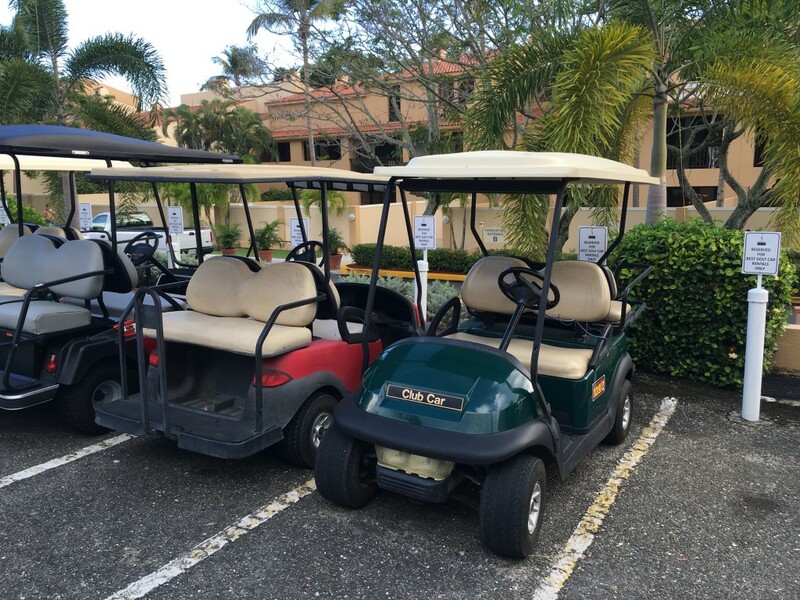 Club Cala de Palmas golf cart rental starts at $35 per day, with nicer cars and more options, and can be reached at 787-718-0144 (located near Palmanova Plaza). Palmanova Plaza is the heart of the community and has a little bit of everything. Blue Hawaii – Chinese and Asian cuisine, take-out and delivery options. Lunch specials Noon to 5 PM. Dinner portions big enough to share or left-overs. Try the Hawaii 5-0 pork dish, or any of the dinner specials. C Bar Kitchen – Upscale dining. Fresh, local ingredients with a regularly updated menu. The menu includes light starters, more substantial starters, entrees, and dessert. Perfect for a special night out, celebration, or any excuse for a fantastic meal. Chihuahua Tex Mex – Good margaritas, decent TEX-Mex. Full warning, if you are from Arizona or Mexico, then you will immediately taste this is not authentic Mexican food (nor do they claim it to be), it is definitely Texan, but it is the closest to Mexican food in Palmas. Flying Pizza – Thin crust NY style pizza. Delivery available within Palmas. La Brochette – As expected, the appetizers and brochettes plates are small, split between 2 people they are a few bites each. The entrees range from normal to large portions. Get the chef’s special! Best patio on the plaza to view the beach below. Pura Vida – Simple, local Puerto Rican food. Ceviche, mofungo, plantains, and seafood are excellent in this casual dining setting. Our favorite casual restaurant in Palmas. Consistently good food, excellent service! Friendly bilingual staff. Zona Fresca – Local bar and grill, great hamburgers and grilled sandwiches. Skip the fries and get tostones or rice and beans. Very popular with the locals. Great prices on local beer and house drinks. Palmonova Plaza Market contains a sandwich and coffee shop, as well as basic groceries, sunblock, OTC Medicine, and a well stocked liquor selection. Local Criollo bread is available hot daily in the market and oh so delicious! Chez Daniel and Tapas Bar upscale French and International cuisine. Large patio to accommodate large events, rehearsal dinners, celebrations, and Art Night activities. Excellent food and great service. Best wine selection in Palmas! Consistently the best meals are the evening’s specials. As of January 2018, Chez Daniel is closed due to Hurricane Maria. No ETA for opening. La Pescadería located at the end of Harbour Drive (near the Marina). Waterfront patio seating for lunch (11 AM to 7 PM) offering the best fish Tacos in Palmas! The upscale restaurant offers inside or patio seating and is only open for dinner. Aracelis Salón & Spa located in the Chez Daniel Plaza near the Marina. A small salon offering hair services and two stations for pedicures. Closed Mondays. Barber Shop located in Palmonova Plaza. No appointments needed, excellent service, and great haircuts for Men and Boys. Bella Época Salón is located outside of Palmas, in the Humacao Plaza Palma Real shopping center (near JC Penney and Walmart). Two level salon offering nail services and hair treatment. Excellent haircuts. I bring a picture of the haircut I want to avoid any confusion (the owner, receptionist, and many employees are bilingual). As of January 2018, the salon is still closed due to Hurricane Maria. No ETA for opening. Corpus & Esthetics: Massage only (located next to Palmas market), open evenings until 9 PM. Text Edna at (787) 907-4440 for appointments. Cash only. Los Lagos day Spa is located off of Nursery Road at the North end of the community (across from the Catholic Church). Offering beautiful views from the infinity pool, a heated hot tub, and warm Watsu pool. The property expanded in Summer 2016 to include 2 pedicure stations, and additional hair stations. The grounds are lovely, but the service can be unpredictable and appointments are often mismanaged. Be sure to confirm service prices before treatment, as prices seem to fluctuate on a whim. JC Penney and Walmart both offer nail services in the Plaza Palma Real locations in Humacao, outside of Palmas. I was told there are very few English speakers at each location, but my Spanish speaking friends have had great experience and are pleased with the results. As of January 2018, nail services are no longer offered due to Hurricane Maria. No ETA for opening. 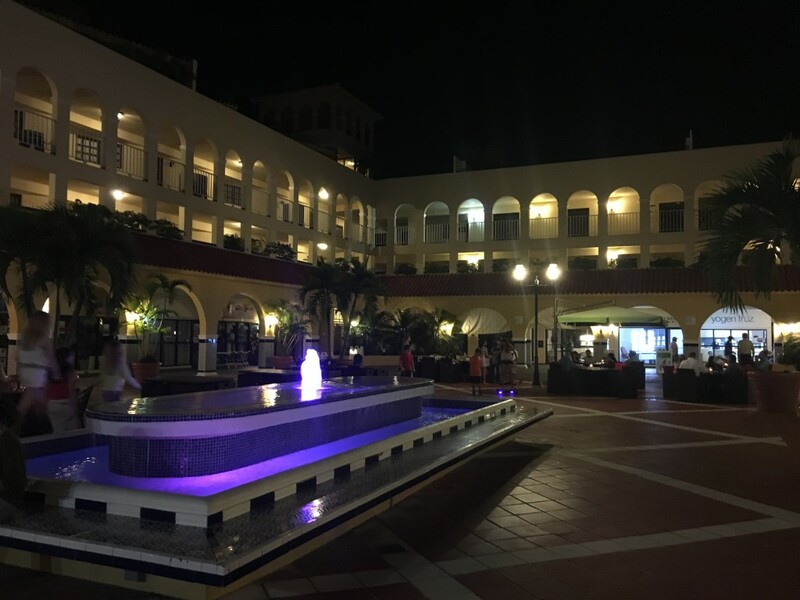 If you decide to make Palmas your permanent home, there are several Real Estate agents, insurance company, Banco Popular bank, and more services to get you settled in. 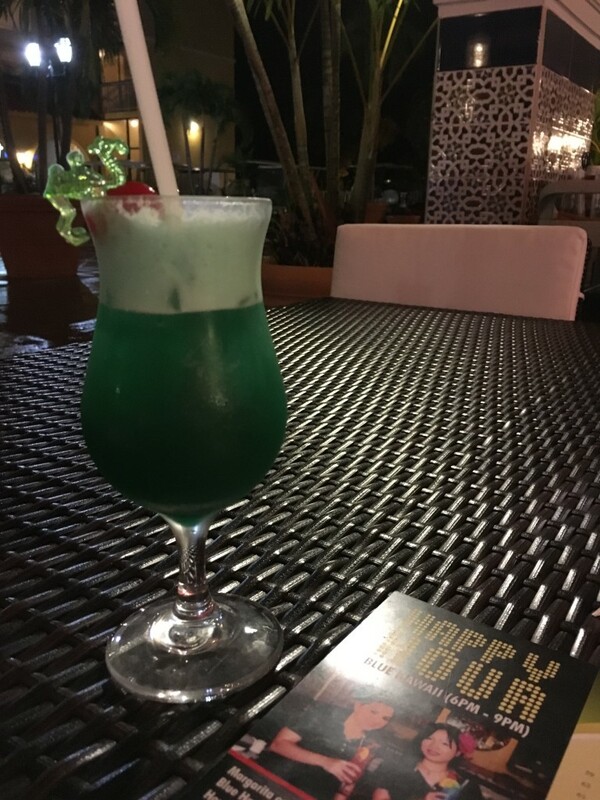 The BEST beach bar is Bohio, easily accessed while walking on the beach, from the Wyndham, Beach Village condos, and down the beach from Palmanova Plaza. 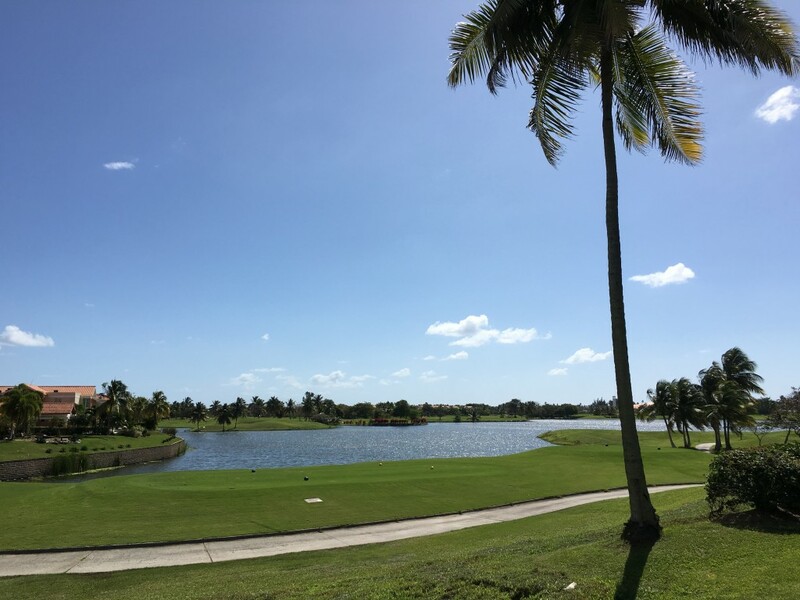 Bohio offers great local food and drinks, steps from a golf course, with plenty of golf car parking. Bohio closes at sunset, since it is surrounded by Sea Turtle nesting areas. Bohio is also a great location for sunset beach wedding! As of January 2018, the Bohio beach bar was destroyed by Hurricane Maria. No ETA for rebuilding. Palmas is a gated community with 24 hour private security. The most common “crime” is a someone taking your assigned parking spot! 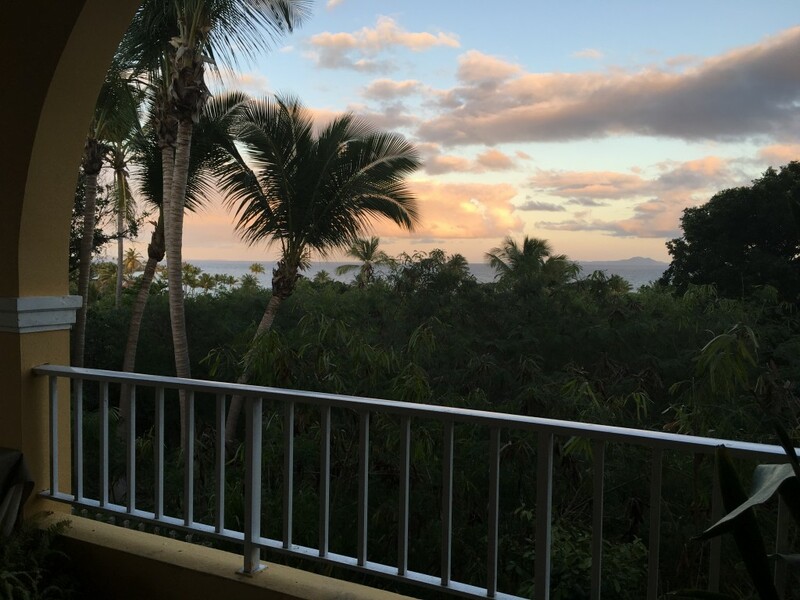 This little slice of heaven is a perfect resort getaway to relax (or live) in Puerto Rico! Updated in December 2016 and Spring 2019 for more current information since Hurricane Maria and the recovery efforts. How far from the airport in San Juan? 3 – 4 miles? The San Juan airport (SJU) is approximately 29 miles (65 Kilometers) from Palmas del Mar and it takes about 45 minutes to an hour to drive between SJU and Palmas. Visiting there in May with a group of friends, would you know of any charter boats to Playa Caracas/red beach? I usually take a scuba boat out to Vieques, so I am not sure of the local charter boats to Playa Caracas. I haven’t made it to Puerto Rico yet, but I’m working my way round Latin America so hopefully will make it there soon! Those crashing waves definitely make me want to visit, it looks so dreamy! I can’t believe you moved here! There must be great weather a lot… or better than here in Amsterdam. It looks beautiful and it’s really helpful that you even listed a realtor to use. Thanks! I can’t believe that we have been in Puerto Rico for a year. I love it here and want to share this amazing island with everyone! Do you need to reserve a golf cart ahead of time or are there plenty? For high season weeks, like Spring Break and Christmas, you absolutely need to reserve ahead of time. Other weeks there are plenty of golf carts available and can be picked up without reservation. Palmas is a family friendly community. There are many activities for the children; family events at Palmanova Plaza, kids tennis, school activities, kids golf, and so much more. How great that you live in a place where you can get around by cart! Thanks for sharing all the eating options – I find it’s always difficult finding a good place to eat when traveling. This sounds great for a family vacation. I would love to take my mom to a resort but the last one I visited was too big. I love that we could rent our own golf cart to get her all over and hopefully make her more relaxed and able to enjoy her vacation! Wow! This sounds like an amazing. I could totally live here. This will have to be one of the places I stay when I visit Puerto Rico. I was trying to surprise my husband with a trip to PR this spring, but it hasn’t worked out yet. 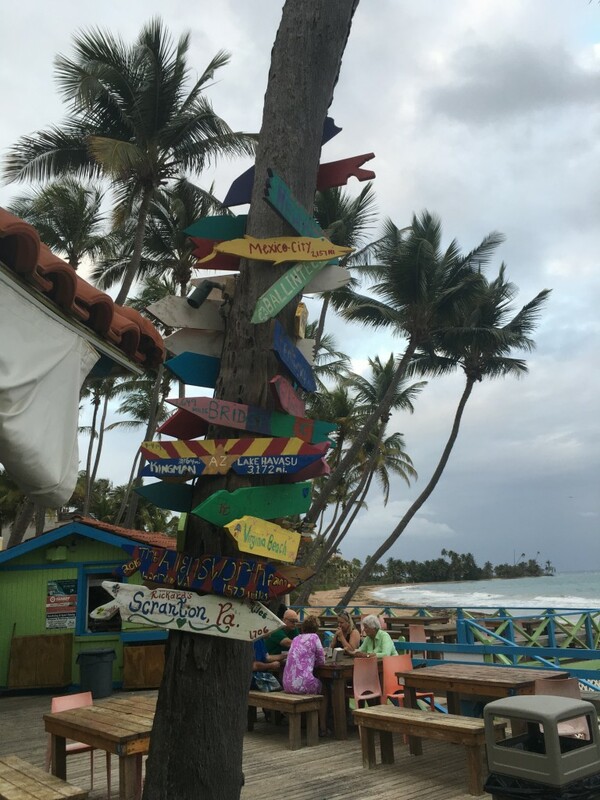 There are so many great places in Puerto Rico, you should absolutely come visit! I love Puerto Rico and I have been meaning to get back soon! This looks like a great area to visit. My husband always toys with the idea of moving there or St. Thomas – I don’t think he will pull the trigger but my fingers are crossed! Puerto Rico and St Thomas are great for American Digital Nomads. No passport, no VISA restrictions – you can come and go as you wish. Wow, we could make this our home! I love how calming the wave crashing video was! I could put that on loop for hours to relax! It’s like an all in one resort. I like the building design from how they make an art on a tree, putting all those colorful wooden stuff with a word on it is just so beautiful. The place looks so quite as well and a peaceful Resort. A perfect place to unwind and would love to spend my weekend here if given a chance. The idea of tooling around in a golf cart really appeals. The restaurants really sounded delicious too. Would be great to try the local criollo bread! Lovely, looks like it has everything you could possibly need there! I love the golf cart videos too! James – Yes, I would love more information so that I can include Harbour Lakes! Jen, your take on Palmas is right on. We’ve been coming here from the States for 20 years and my wife’s family came here from San Juan during her childhood. We would love to move here, but probably won’t happen until after our kids have grown. I highly recommend this beautiful place to all, for a great vacation! 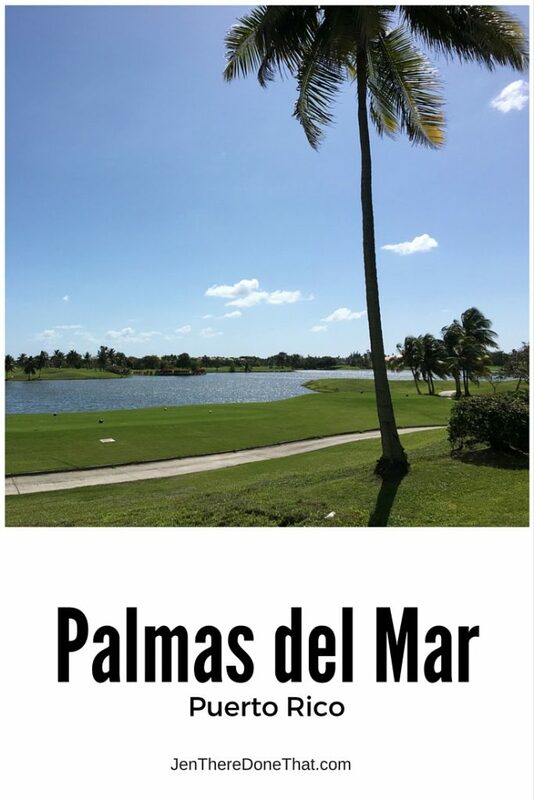 Hi, I am planning on retiring in Palmas Del Mar. Can someone please share the median condo price for a 2 – 3 bedroom? Contact a realtor for current prices and selection. I recommend Costa del Caribe. There are multiple condo complexes. Price depends on how new, features, which subdivision, etc. Thrilled to find these posts! 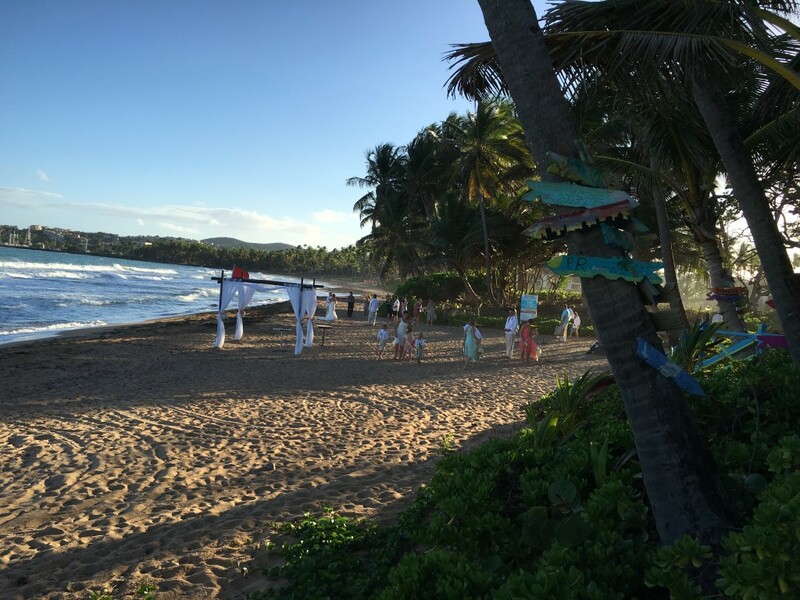 We fell in love with Dorado Beach when we visited and we have been thinking of PR for retirement. We loved staying in San Juan as well. Jen, Welcome to Puerto Rico. Your take on Palmas is fabulous. We have been there both to stay at some condos(can’t remember the name), it was within walking distance of the pool and the marina, and to the casino for Poker(when they had it). We thoroughly enjoyed our stay and I had the best tan ever since I was at the pool daily. We walked near the beach and marina and just plain relaxed. Hope that you enjoy your stay there. Is it permanent? or just for vacations? If you will be here around April 9, we are having a expat get together and would love to have you and yours to our home in Quebradilla. You can private message me or email me for info if interested. Thanks, Tonie! We love it here in Puerto Rico. This is our new full time home, it just feels like a vacation!